Encrypted server to client communication keeps your IP address safe. Stop getting ganked because you're logged into Skype. Our resilient Erlang backend running on the cloud has built in DDoS protection with automatic server failover. Download the free mobile app to chat while on the go or summon your AFK friends by sending a push notification with an @mention. Easily share images, videos, and links from your desktop or phone. Discord embeds most types of media directly in the chat. GIFs only play when you mouse over them, so your CPU is spared. Post those GIFs. Oh yeah! Designed for use while gaming, Discord has minimal impact on your CPU. Your game's performance won't be affected in the slightest. Seriously. It's time to ditch CPU hogs like Skype. It takes just 10 seconds and doesn’t require any drivers or weird setting configuration. 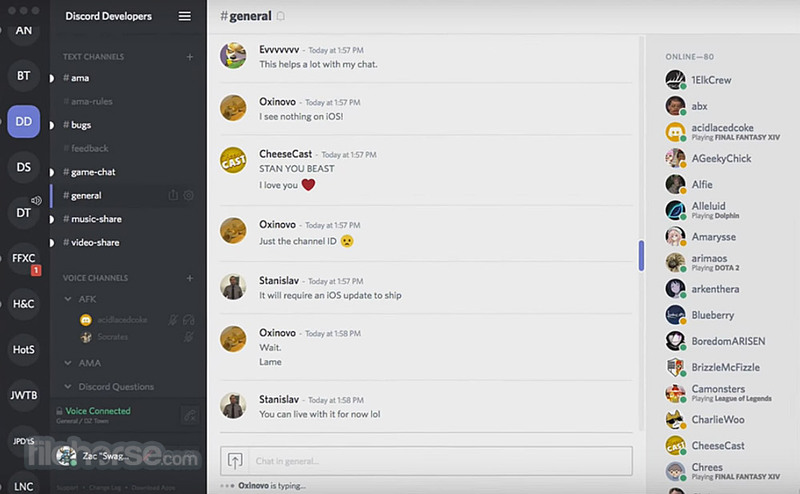 Discord can even run in the browser which is great for PUGs you invite to your voice channel or those stubborn friends of yours. You can download the Windows or OSX app for maximum performance. Robust permissions and multiple channels, all within an easy-to-use UI, make Discord perfect for both small groups or large guilds. Finally, the power you’ve come to expect from TeamSpeak, Vent, and Mumble in a package that isn’t ridiculously complicated. Discord is built with the latest tech using a modern jitter buffer, automatic gain control, noise suppression, echo cancellation, system attenuation on Windows and more. You'll love it and it works everywhere: desktop apps, browser apps, and phones. 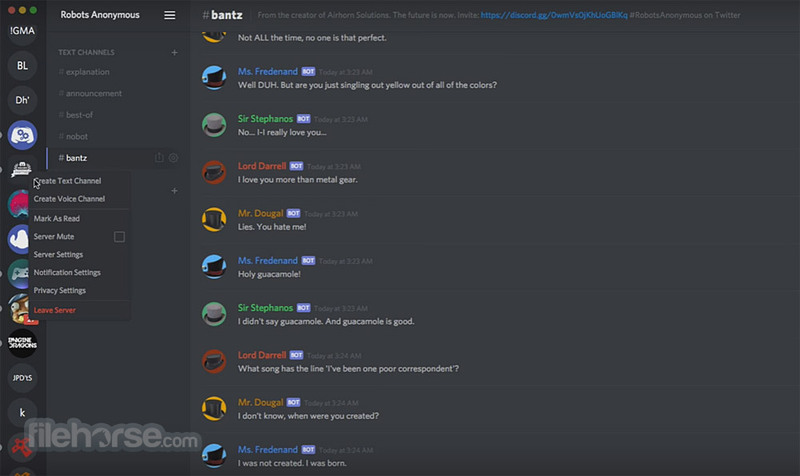 Discord allows you to add friends and individually message them outside of servers. Use our block feature to prevent direct messages from baddies. We even hide the offenders' text in servers - keep your eyes pure! 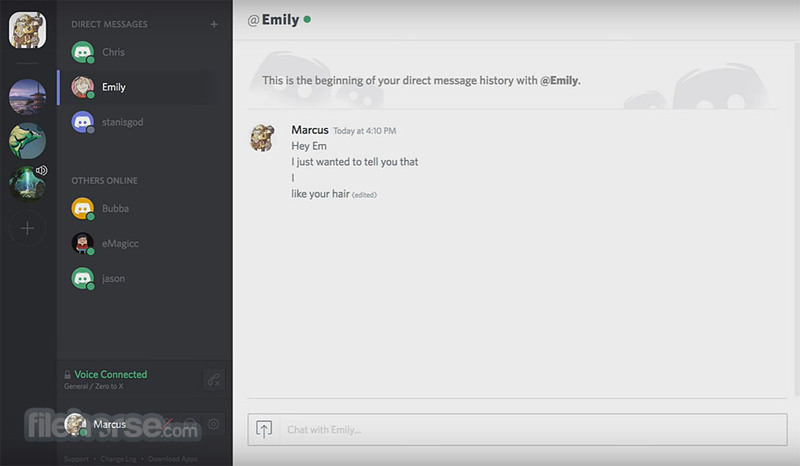 Discord's customizable overlay allows you to see who’s talking in the middle of the action. You can also adjust individual volume settings, change servers and channels, or even kick people all without leaving your game. The overlay requires the Discord Windows Client and works on most games that use DirectX 9, DirectX 11, and OpenGL.